Yes, it has been way too long since the last nail of the day post. Bad blogger, I know, but my nails have been splitting and peeling for months now and I took a break from nail polish to see if that would help them. It didn't. So today I started using something that I bought before Christmas and see if that will help them. Anyway, on to my nails. The past few days have been a bit grey and dreary and I was inspired by that but needed to sparkle it up a bit, I mean come on, it's a new year! Positivity and happiness is what it's all about and glitter = happiness. Fact. 1. Your base polish. In this case it's NYC's Sidewalker. 2. Your glitter polish. We have OPI's Spark de Triomphe which I found in TK Maxx recently. 3. Top coat. I'm using Seche Vite. 4. A make up sponge. You can find these in Boots, Penneys, Superdrug etc. 5. Something to put the polish on, in my case it's an envelope for a birthday card, classy. All I did was apply a couple of coats of my base coat on and let it dry. 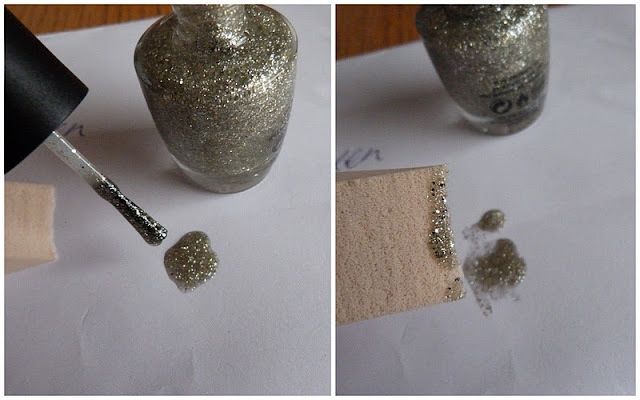 Then I applied a couple of dollops of the glitter polish on to the envelope and lightly dabbed the edge of the sponge into it, comma ca. I'm still getting used to my new camera so apologies for any blurriness and even more apologies for the absolute state of my cuticles. I'm going to get a tripod soon to eliminate the dreaded blurry macro shots. If my nails were a bit longer, I would have had more room to make the gradient a bit more gradienty, but I'm happy with the finished look. It looks really pretty in artificial light and it's something easy peasy that anyone can do. Go on and give it a go! You can do it with any polishes that compliment each other. I can't wait to give it a shot with some other shades, I'm thinking navy base coat and maybe a silver gradient? It's kind of good that the nail treatment I'm trying out at the moment says I have to use it every second day, it means the polish will be coming off soon and more playing around! That looks lovely!! Well done. We do need a bit of glittery nails to make up for gloomy january! love the mani, maybe I'll try out something like this for myself. I keep seeing looks like this but I'm always nervous for trying it out, and not liking it but not having time to start over. 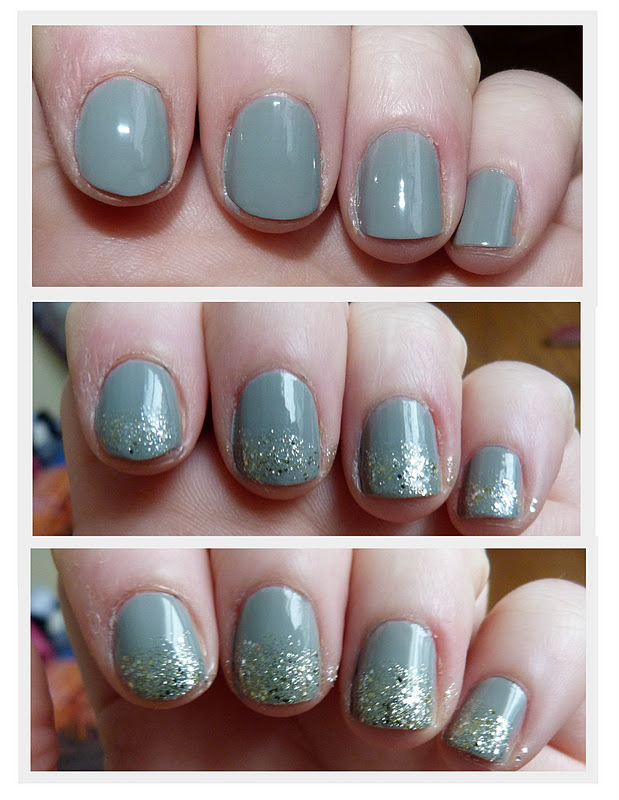 I love the grey polish you used, perfect for winter! 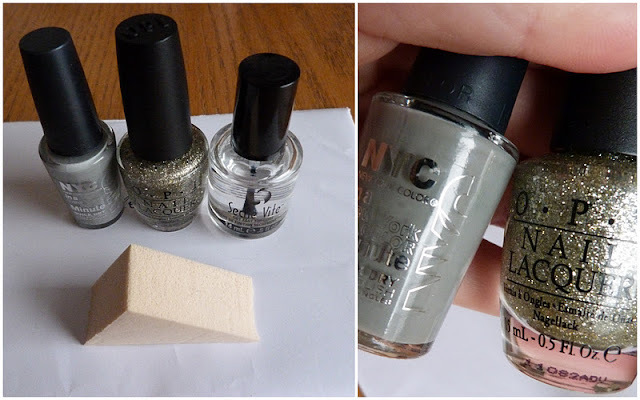 Yep, love that grey, the sponge method is so much easier than the dazzle dust. Looks great!